Back for a second day at the Texas Instruments Teachers Teaching with Technology Conference, and hearing some great ideas from the sessions I have attended. The highlight of my day today was a panel discussion of the Nspire app for iPad, which I have just loaded. The panel was faciltated by TI brand ambassador Dr. Mayim Bialik, who has been a presence throughout the conference on sessions regarding the new app. Dr. Bialik was joined on the panel by teachers Sheri Abel and Stephanie Ogden, who piloted the Nspire app in their classrooms. Stephanie summarized her feelings of the ipad app: “This is what other instructional tools aspire to be”, while Sheri shared a level of engagement from her students she had not before experienced. As one example, Sheri had students drag and re-drag axes and functions in order to develop a conceptual understanding of domain and range. The ability to drag and discover has been the greatest source of positive discussion from the app this weekend, and is seen as a gamechanger. While the app is an exciting tool for discovery, the panel also noted that ipads certainly cannot be used for standardized tests. To me, it will be a tough decision for schools to make a decision between ipads and handheld: the expense is not insignificant. Also, schools may need to make a choice between continuing a TI 84 culture, or transitioning to an Nspire culture. 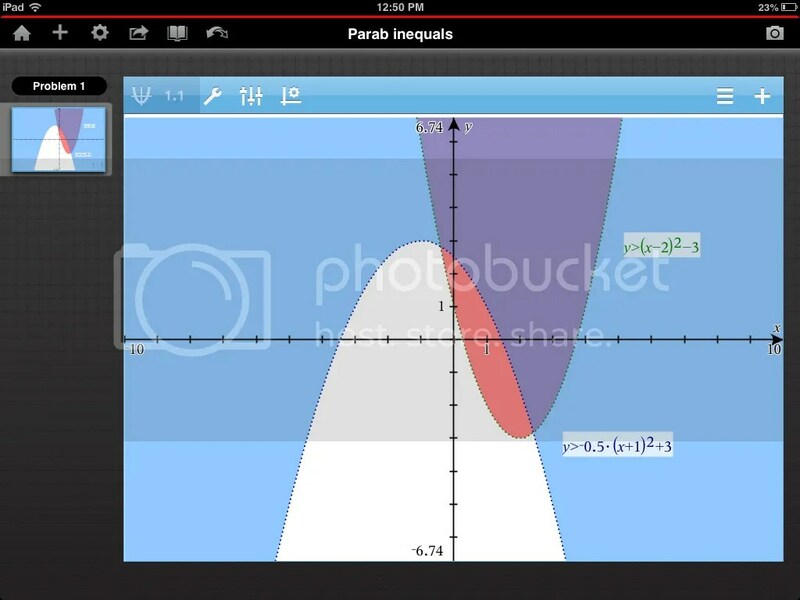 Coming soon, I will take the app back to my schools and hope to work through a lesson or two with classes. I will share my reflections in a later blog post, so stay tuned…. The opportunity to graph functions in color, and have a color background, makes it so much easier to identify and compare graphs. Pictures can be added as backgrounds. 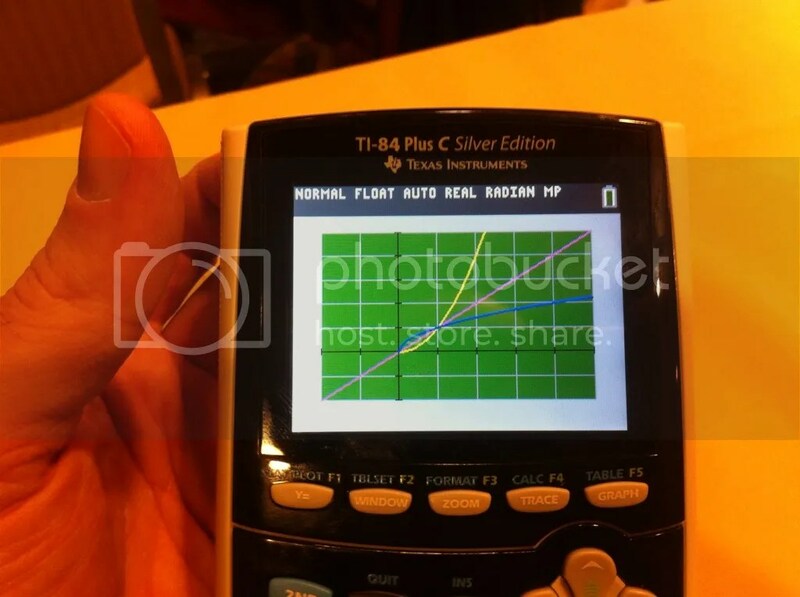 The calculator comes with 5 pictures, just begging for function-modeling, and your own photos can be added by using TI Connect. No more AAA batteries! If your math department spends crazy money each year just on batteries, this is a huge improvement. 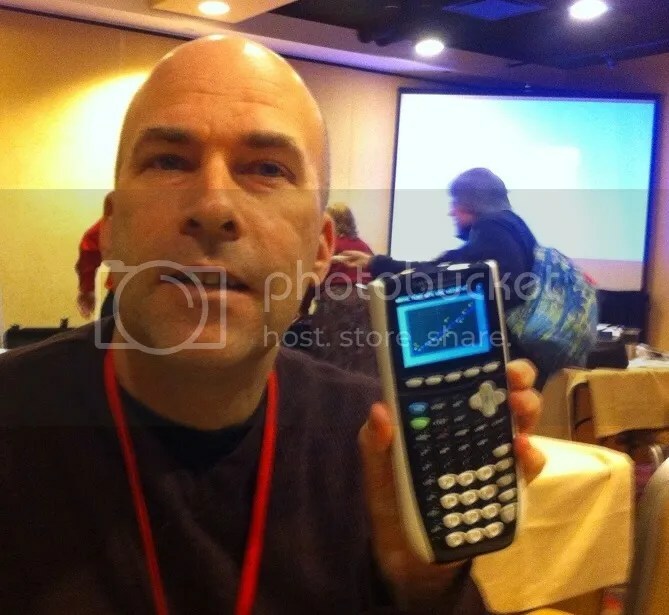 Calculators can be recharged using cables, or a docking station. In chatting with TI trainers, they tell me that a calculator will hold a change for about 20-30 hours, or about 2 weeks of occasional use by a student. Besides utilizing the new features of the 84C, this session also modeled composition of functions, and how to use the 84 to facilitate class discussion of domain and range of composites. Problems from AP Calculus were used to look at graphs, shaded areas, function tables, and TI’s real-type features. Great stuff I will take back to my colleagues. On Friday, I had the opportunity to sit down with Mari and Dale from TI to discuss some of my concerns about the latest wave of TI products, in particular that there is so much new stuff coming out at the same time….so much so that it becomes tricky for teachers to select a product and standardize their building technologies. Dale, who has been involved with TI for 16 years, did an excellent job of walking me through TI’s thought process. With the 84 color, TI has acknowledged that, while the Nspire and its iPad app have improved educational capabilities, the is a large core audience which is attached to the 84. Ignoring them or forcing them into the Nspire would not be wise, or very nice. Also, the overall look of the 84 had not changed for some time, even with vast improvements, and decreased cost, of memory and color screens. So, now we have the 84 C! And its improved interface is worth considering for your classroom. If you read my blog post a few weeks ago, where I broke up with TI, I need to give you a status update on our relationship. I’m happy to say that we talked things out, and I will be happy to be in a relationship with TI for quite some time! 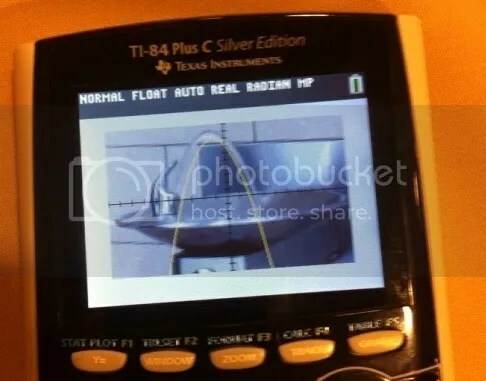 This entry was posted in Technology and tagged calculators, TI. Bookmark the permalink. I enjoyed this post…! I, too, attended the T^3 conference in Philly and really enjoyed it. I share some of your “unrest” about the many different directions TI is going (84C, Nspire, Nspire app, etc.) — thanks for sharing this! At our district, we have transitioned into the Nspire CX’s and LOVE them. We are 1-1 with MacBooks, so we also use the Nspire software on these for certain investigations. Now, with the iPad app (and a class set of iPads), this will be an option, as well. I think it comes down to devising a careful, deliberate plan about integration. For example, I think the TI-Nspire app will work REALLY well with Geometry explorations — explorations I felt were too constrained or difficult on the handheld in the past. However, explorations in Algebra II and/or PreCal that require a lot of graphing or function entry might be best left to the computer software and/or handheld platform. We are working out the kinks, but it is SO wonderful to have so many positive options to choose from…! I would love to hear more about how your school is implementing these various technologies. I teach Geometry, Algebra II, PreCal, and AP Cal at a small school in West Texas. Thanks!